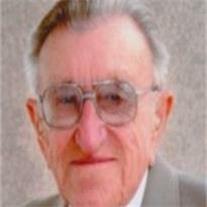 John Frederick Quade, 94, of Mesa, Arizona, formerly of Vandalia, IL, passed away September 26, 2012 in Mesa. A memorial service will be held 11:00 AM, February 19th at Fairlawn Cemetery, Vandalia, IL. Mr. Quade was born November 12, 1917 in Brownstown, IL, Son of Frank E. and Edith L. Quade. He was a 1935 graduate of Brownstown High School and attended Browns Business School in Centralia, IL. Mr. Quade was married to Mildred E. Harris on January 18, 1941. He was in the Navy during World War II and served in the South Pacific for two years. He worked for FS Services, now Growmark, from 1945 to 1979 retiring from Kingston Mines River Terminal as supervisor of the Ammonia Terminal. Mr. Quade was a member of the First United Methodist Church in Vandalia, attended Community Chapel in Trailer Village in Mesa and became a member of Velda Rose Methodist Church in Mesa. He was active in Cub and Boy Scouts, while his sons were growing up. Mr. Quade and his family spent many vacations camping in their travel trailer. He was a member of the Masons. Mr. Quade is survived by his wife: Mildred, of 71 years; his sister: Rosemary Carson of Godfrey, IL; two sons: Fred Quade of DeKalb, IL, Gary Quade of Tempe, AZ; and four grandchildren: Emily, John, Cameron and Keaton. His parents preceded him in death.